Are you supporting someone in the Military? 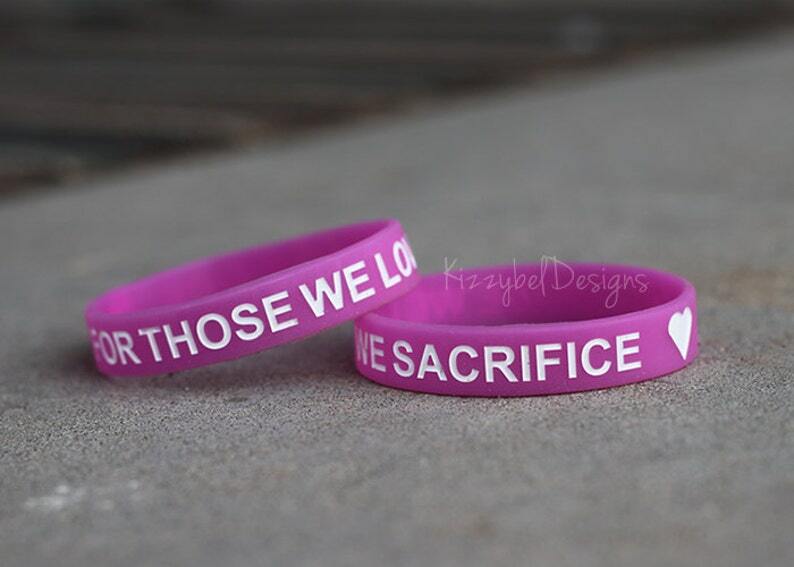 If you are, these Rubber Support Bracelets are a MUST HAVE! A fun and trendy accessory to show love and support for your MILSO! Choose between 7 different colors & support phrases or simply get one of each for yourself and your Besties. Color and phrase as pictured, can not be changed. Listing is for one (1) bracelet. Available in Size 7 or 8 inches. Very quick and great quality. Kizzybel Designs is NOT responsible for any delays via transit, especially during holidays. For your convenience we will provide delivery confirmation so that you may be able to track the status and placement of your package. All orders will be shipped to the address provided on Etsy at checkout so please make sure it is correct. If your order is being returned to us, we will be happy to reship it at your own expense. Once an order has been shipped, we are no longer responsible for it. Furthermore we aren't responsible for items lost, stolen, delayed, misdirected or damaged during transit. Due to the custom nature, all of our items are non-refundable. We do not accept returns under no circumstances. All sales are final. To avoid misunderstandings, please read the item description carefully before ordering from us. If you have any questions about a listing or something is unclear please send us a message prior to ordering. If there was a mistake made on your order on our end, please contact us immediately and we will be happy to correct the mistake. Items must be sent back in new, unused condition. Shipping costs are not refunded. Glitches are not honored and will be refunded. We reserve the right to cancel any order and issue a full refund. Tracking numbers are sent to the email address associated with your payment form once your order is ready for shipment! You can also locate it in your Etsy account once we printed your label. Visit USPS.com and enter your tracking number to locate your package. It may take 24-48 hours for tracking numbers to update. Remember, we see the same information you do on the tracking information. You may also contact your local post office for further assistance. Once your order has been submitted you cannot make any changes to it nor cancel, as we have already taken measures to begin production of your item(s). Please be sure to decide on color/design options before placing your order. If you have any questions or would like to request a change in design or color please message us prior to ordering and we will be happy to work with you. Promotion and Coupon codes are posted randomly and quite often on our Social Media sites. Be sure to follow us on Facebook, Instagram, Pinterest and Twitter to stay up to date on our current promotions and giveaways. All Designs are copyrighted by Kizzybel Designs. I created each and every Design and they may not be copied in any way. All items are made for personal use only! Items can not be resold or distributed commercially. All items will only be created after payment has cleared. Please Note: If you are a buyer located in California, you will be charged sales tax in conjunction with California tax laws. We will not enclose receipts in our packages. Your invoice is your receipt, please print it for your records. **Kizzybel Designs reserves the right to change these policies at any time. Copyright © 2018 Kizzybel Designs, All Rights Reserved.